but that will be tomorrow. You see, I feel like half of Nordstrom went on SUPER SALE yesterday, and my first commitment is always to bring you girls the deals. Mama loves a good sale. There are some new things on sale that you haven’t seen on the blog yet, but there are also other items that I have talked about previously (and LOVE!). And now they are on SUPER sale! So, we are going to look at some new stuff first. I put some of it on facebook yesterday, but it hasn’t appeared on the blog until now. 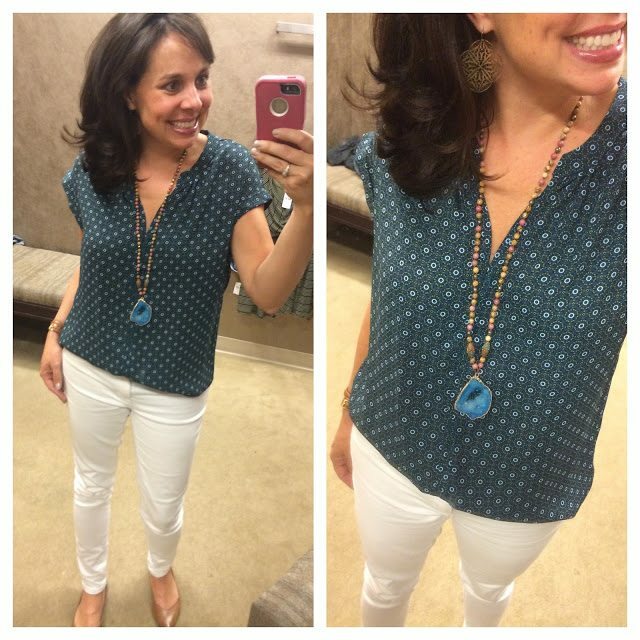 This blouse is 65% OFF! It was regularly $68, and now it’s ONLY $23.90! TWENTY THREE DOLLARS! *The necklace is not yet available online…..but it will launch in a week or two, and when it does, I will let you know immediately. Because it’s AWESOME. 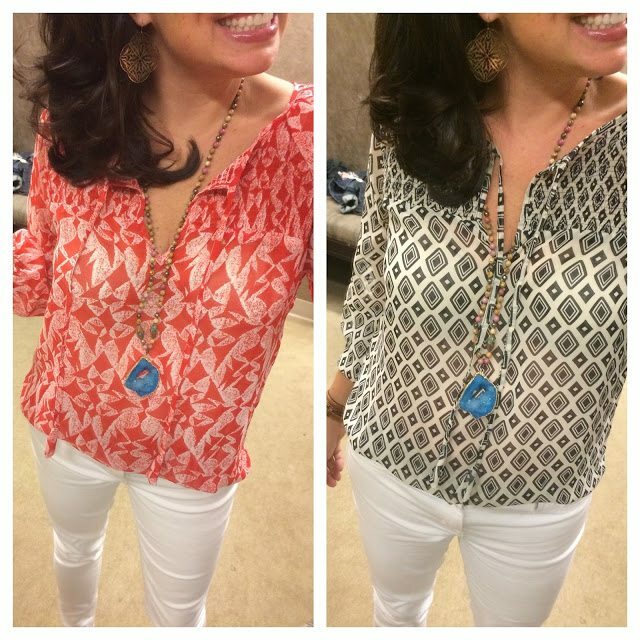 The website says the blouse above (also seen below on the left) is red, but when trying it on, I thought it leaned more orange. 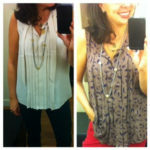 And here’s the same blouse in the ivory and black diamond pattern on the right. It would look great with black dress pants. They are very sheer, so even I’m not wearing a cami with them here, you would definitely need to. And you can find my favorite $12 camis HERE. I wear mediums in these camis, so I would suggest sizing up. Again, I’m wearing a small in the blouse. The blouse comes in 7 different colors and patterns, and I might have ordered the red and grey paisley to go with my grey jeans. Okay, I did. BECAUSE TWENTY THREE DOLLARS. Here’s another color combo of one of my favorite tops. Several to choose from, so click HERE and see what’s left in your size. For size reference, this one is a small. Are you excited about the necklace yet? You should be. I hope it launches sometime in the next 2 weeks. and I will be sure to let you know when it does! It’s not as stretchy and soft as our much loved Kut from the Kloth jackets, but it’s still really cute! 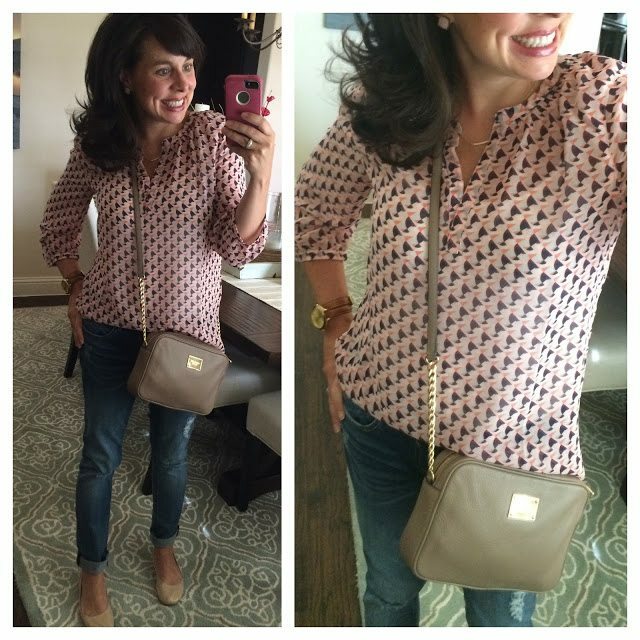 And do you see the darling necklace peeking out in this pic? It’s not on sale, but it’s only $26! It will look great with plain ol’ tees, but it will also look so cute peeking out underneath chambray and flannel button ups this fall! And do you remember this necklace when I highlighted these sweet necklaces back around Mother’s Day? I ordered a “C” for Carter and Chris and an “S” for Sheaffer and Scout! I covered our entire little family with 2 initials. When I received them, I took one of the discs off of it’s chain, and I put them both on one chain. I love how the discs mix metals (takes the guess work out of it for those if you that are nervous about mixing) and the raised design is so eye catching. Click HERE for the initial necklaces. At 40% OFF they are $23.40!!!!! If you have more than 1 kiddo, you can get each of their first initials. My floral blouse is from LOFT last year (sorry!) and I’m wearing my favorite BP cami found HERE. This next outfit has the grey skinny jeans that are now 50% OFF (going fast). For size reference, I’m wearing a small in the sweater. It also comes in a great burgundy and navy, and I love all 3 colors! You do have to wear a cami under this sweater because the back is the pleated sheer material. I suggest sizing down 1 size in the jeans (I’m wearing a 26). Here’s a close up of the jeans. Sizes going fast. I’m 5’4″, and I have them cuffed up under in these pics because they are a couple of inches too long. I’m going to get them hemmed, but that’s good news for you taller girls! This blouse is similar to the first one I featured today, but it’s a different label and comes in different color combos. For size reference, I’m wearing a small in the blouse, so I would say it’s true to size. And just like the first blouse, you need to wear a cami. When she tried it on, I died. AND NOW IT’S 50% OFF!!!!! jeans 40% OFF NOW !!!! 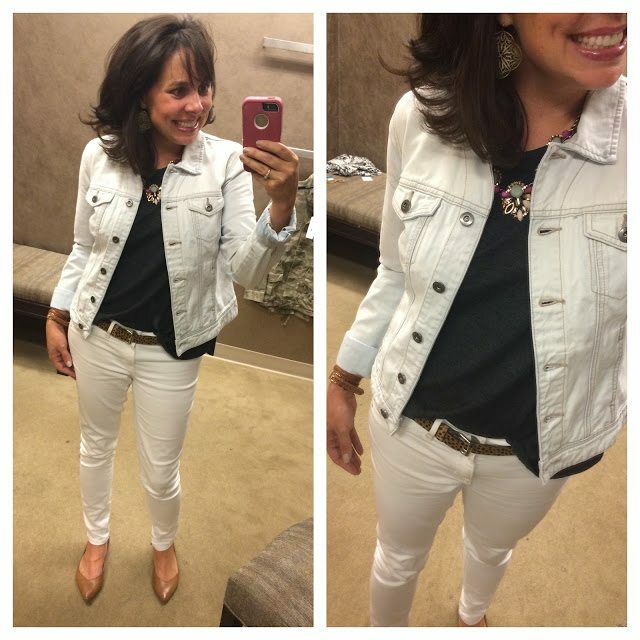 Penny absolutely LOVED these jeans, so you might want to check them out! 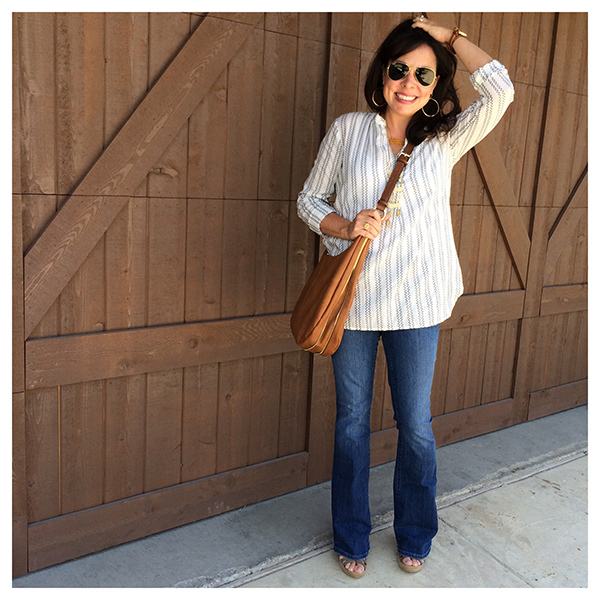 They are Kut from the Kloth boyfriend jeans, and Penny felt great (and looked AWESOME!) in them! 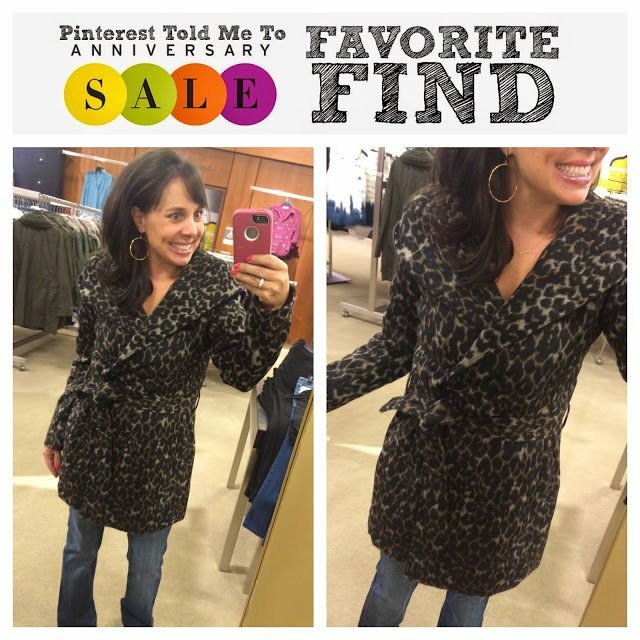 And THIS leopard coat was a favorite find during the sale. I’m wearing an x-small, so I would definitely suggest sizing down. Click HERE for the coat (now 25% OFF!) Click HERE for my favorite earrings. 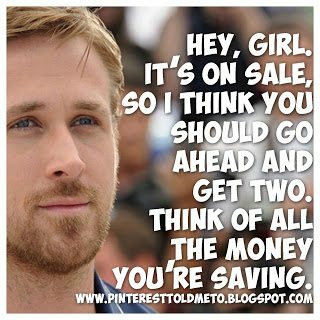 AND there’s actually LOTS more ON SALE! Check out all the Hanky Panky on sale (most 40% OFF) HERE. My favorites are the regular rise and the mid rise. Lots of Zella live in leggings are on sale HERE. I have THESE and THESE and love them both. I wear a small in all live in leggings. There are 19 Michael Kors bags that are 40-50% OFF HERE! Lots of Kate Spade bags in the sale HERE. 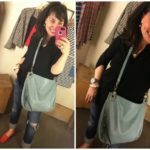 And there are a lot of great Rebecca Minkoff bags in the sale HERE! All between 40-50% OFF! Check out the Kate Spade initial bracelets HERE and a darling green KS watch HERE that’s 50% OFF (making it UNDER $100!) and a light pink quilted watch HERE that is 40% OFF. All MK watches in the sale HERE (24 to choose from)! All Kut from the Kloth jeans on sale HERE. All Vigoss jeans on sale HERE. All DESIGNER jeans on sale HERE. And last, but certainly not least, the CASLON TUNICS that we all love with our HUE ULTRA WIDE WAISTBAND MUST HAVE LEGGINGS are now on sale! Depending on what kind of fit you want will depend on what size you get. If you want to wear with jeans, I would size down one size. If you want to wear with leggings, then get your regular size. 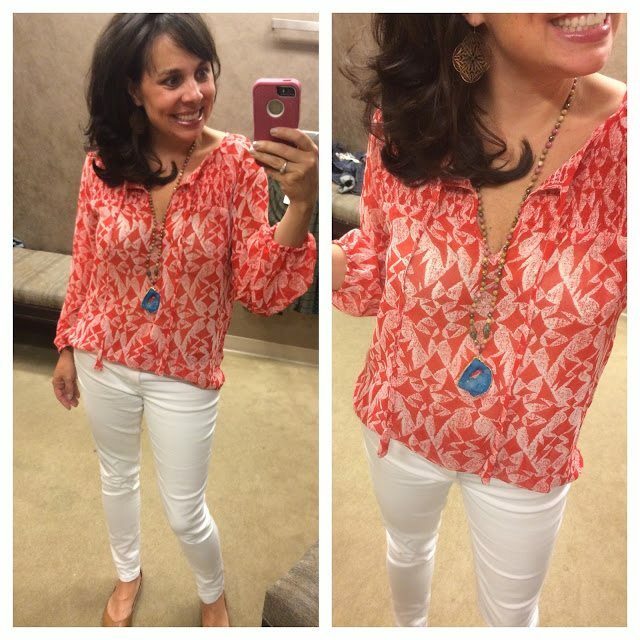 Click HERE for the tunic. SO THAT’S IT FOR NOW LADIES!!!!! I hope the sale round up was helpful! See you back here tomorrow for my Bachelor In Paradise Recap! 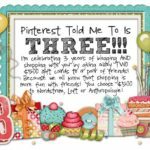 Pinterest Told Me To is 3!!! 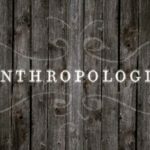 Anthropologie: Why it’s Worth It! Girl!! You found some deals this morning!! I mean I totally understand Ryan's math. I'm just not sure Tab will. Ha! Girrrrrrrl…I mean to tell you, I need everything you posted today. All of it. Such cute stuff on sale!! Thanks for all the sale alerts! When I click on the link to the HUE leggings, they come up at the regular price. Are they no longer on sale? LOL – I went back and clicked on them three times hoping for a different answer. Nope, still not on sale. Just my luck I ordered the initial necklace last week (full price) and the jeans earlier this week (full price). RATZ! Kind of a new follower here but I'm loving your posts. Oh wow! That would be GREAT! Thanks for the info. I love the leopard print trench!! These are great sale alerts!! Thanks!! I had to get the Carlson tunic as soon as I saw you post this. Yippee!!! Thank you for the sale alerts! 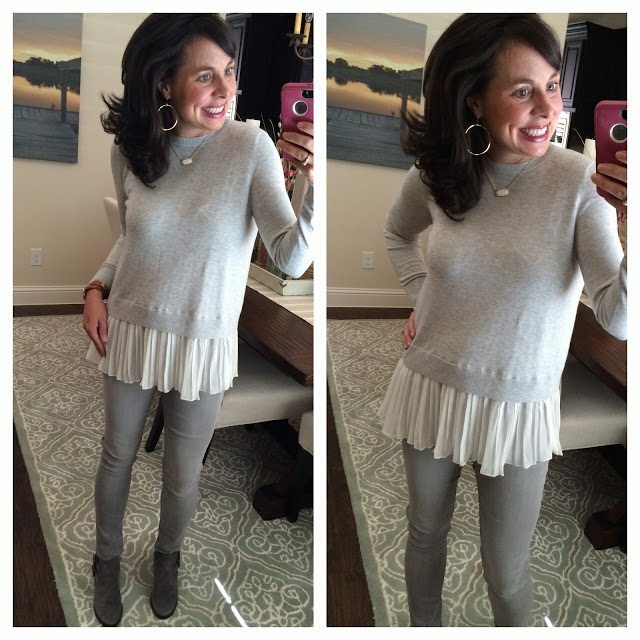 I am dying for those gray jeans! Sheaffer, I doubt that you ever need ideas for your posts, but I have a fashion-issue I could use your advice on! I have some booties that are so cute, but I keep getting a little confused wearing them. I know to cuff my jeans a little to show just a bit of ankle with them… which I have mostly figured out, except I am always wavering between one big cuff, or rolling a couple small cuffs? 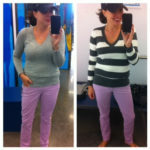 But my big dilemma involves other pants! For example, I wear some black skinny pants to the office a lot. Would I cuff those with my booties? Like a jean? Or let them come all the way down? I also have some cropped pants that show 4 inches or so of leg… can you wear booties with those? Obviously, I need some bootie help. Maybe other people do too? I need help too! This would be a great post! I hate looking like the clueless mom who looks likes she's trying but obviously hasn't figured it out right! Me too, me too! I bought the gray Ivanka booties you recommended AND the Rag and Bone booties (that were way, way too expensive but so cute) – both at Anniversary sale! I have never been a bootie girl so I need some direction too!!! The mint and coral BP studs $4!!!! Okay okay okay…. I am so obsessed with you! 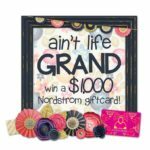 Just found your blog through Shay over at Mix&Match Mama and oh my goodness! I'm a newly wed who happens to have expensive taste (sorry hubby!). I love trying to look cute on a daily basis and with Fall quickly approaching I was in need of some new jeans. 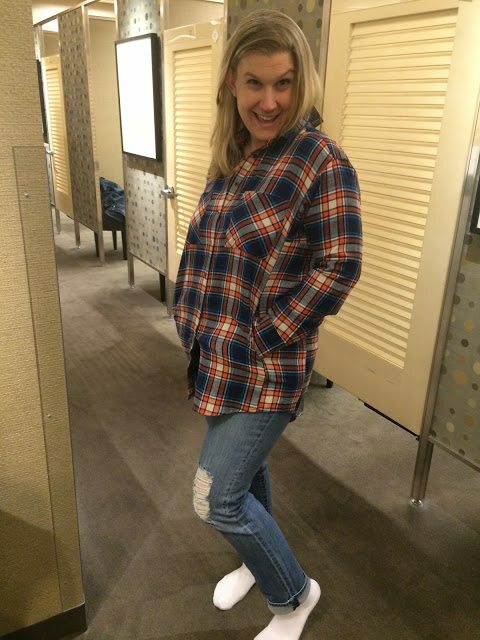 Now–let me tell you how difficult it is for me to find nice jeans to fit!! I've ALWAYS had to ONLY buy expensive brand name jeans to get the right fit for me (small waste, junk in trunk!) but after seeing your posts and reading reviews I was able to buy STS jeans from Nordstrom ONLINE and they fit!!! Didn't have to return! Wow– Thank you Sheaffer for showing us budget friendly girls out here what is available! I could never find this stuff on my own. I am dying over these tunics for Fall–unfortunately sold out online in my size but hey, just an excuse to go shopping 😉 Thanks girl!!! Amazing finds!! But dang those gray jeans are GONE in my size!! When will I learn to get up and come see what you have for me first thing in the morning!! Another post idea….what do you wear under the blardigan? I've been wearing a colored Target tank and a white t-shirt but it seems bulky and not something I can wear with the oatmeal stripe color I purchased during the Anniversary Sale. I teach 4th grade up here in NY so it has to be school appropriate and warm for these chilly winter months! I have the same one and need ideas too…the stripes throw me off :). Goodbye paycheck! Moving to Idaho in a few months and that leopard coat just went straight into my shopping cart! I bought the initial necklace with all three of my kiddos initials. How did you but the two initials on the same chain? Mine will not come off without prying it open and I'm afraid I will break them.